Hoboken, N.J. ; Chichester : Wiley, c2007. xiii, 241 p. : ill. ; 23 cm. Simpleology presents a system for seeing the world and acting in it in such a way that will allow you to bridge the gap between your dreams and reality by focusing on productive actions and avoiding those that will lead you off-course. 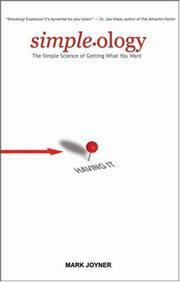 Simpleology : the simple science of getting what you want / Mark Joyner. $c Statement of responsibility Mark Joyner. 500 General Note $a General note Formerly CIP. $5 Institution field applies to Uk. 520 Summary Etc. $a Summary, etc. note Simpleology presents a system for seeing the world and acting in it in such a way that will allow you to bridge the gap between your dreams and reality by focusing on productive actions and avoiding those that will lead you off-course. 650 Subj:Topic 0 $a Source other than LC Success. 650 Subj:Topic 0 $a Source other than LC Success in business.